Complete the Ovair look with coordinating meeting and visitor chairs, taking this contemporary style throughout your entire workplace. With four sturdy legs, in black or optional chrome, OV40A includes the addition of robust black arms, creating a stable seat that is easy to get into and out of. With a great looking hexagon-shaped back and wide choice of colours available, Ovair OV40 offers a highly customisable look for your reception, waiting room or meeting rooms. Comfortable and supportive, Ovair is designed with the sitter in mind – perfect for a quick wait for an appointment or a longer meeting or event. Featuring a deep-cushioned seat, the difference is evident when it comes to leg and bottom comfort during a long period of sitting. And for people who have a tendency to overheat? Ovair’s carefully designed mesh back works brilliantly to increase breathability by helping air to circulate. The mesh is also precisely tensioned to offer good spinal support. Complement your existing colour scheme or branding when you choose from our huge variety of seating fabrics. 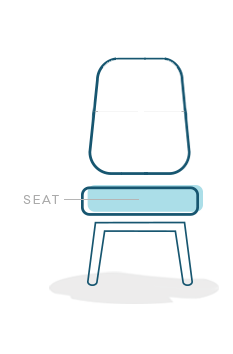 And be sure to look at the rest of the Ovair range for coordinating task chairs and static seats with plenty of options. This model is available without arms here: OV40. Where a product is upholstered in more than one covering, it will be charged at the higher category price. The colours shown here may not be a true representation of the actual fabric and must be viewed as a guide only. Low hazard commercial seating fabrics that are durable, heavy duty and certified to BS7176. Great for task seating but if you are hoping to use this category for soft seating or sofas, then let’s talk! 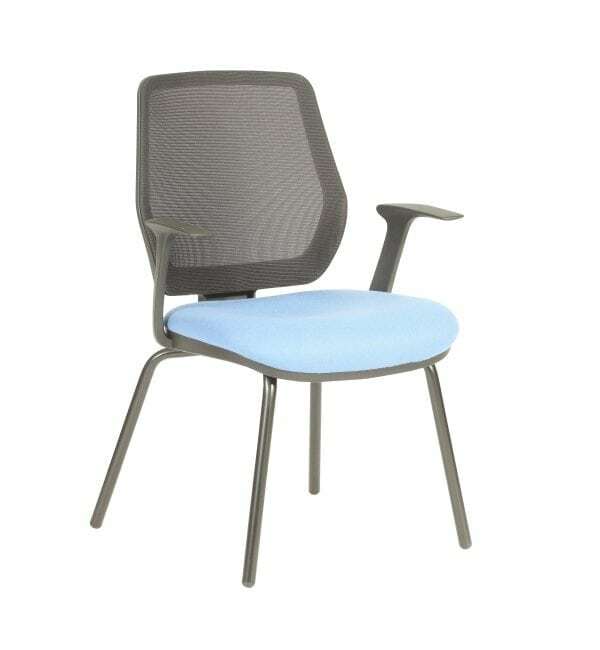 Great for task seating, the Camira fabrics are low hazard and have a 10 year guarantee. Both Gravity and Rivet are made from recycled fabric and have a subtle yet striking textured finish with great green credentials. Includes a black vinyl perfect for creating a dramatic, yet durable effect. Includes fantastic vinyls with really exciting colour ways as well as beautifully textured fabrics. A selection of fabrics with higher wool content and Medium Hazard test certificates. Includes more supplier options (Yarwood, Panaz and Ambla) hich offer a much wider choice of textures, colours and performance. Some of the fabrics in this category have matching drape or bedding fabric available if you want to coordinate seating with soft furnishings. An extensive range of vinyls and fabrics that have very high wool content for a perfect upholstery finish, even on complex sofas and soft seating. Also includes specialist fabrics offering anti-bacterial properties, the ability to bleach-clean or indeed, some with superb environmental credentials. Products with medium hazard certification, offer a more much diverse choice. Includes sophisticated faux leathers, suedes, and chenille textures. Ambla products at this price point have an inherent active ingredient, making them ideal for environments where hygiene and cleanliness are critical. Pure new wool, rich textures and dynamic patterns; If you are looking for something a bit more vibrant, then you’ll find it here. These fabric ranges feel more domestic and sumptuous. A collection of beautiful, soft leathers in contemporary colourways or rich jewel tones to add luxury and distinction to your furniture choices.